Finally! 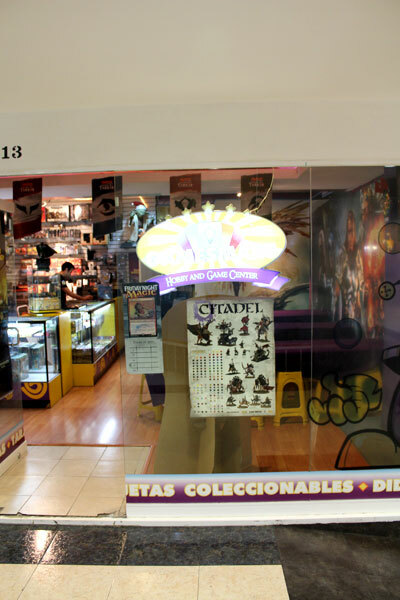 Warhammer Shop (in Mexico). Last week I have visited two wargaming shops in Mexico City. About first visit in ‘El Duende’, you can read in one of the previous posts from February 2015. Even though, I was enjoying ‘El Duende’ so much – I met fantastic people so passionate about Warhammer 40000 – it wasn’t very fruitful for me personally as a collector. I was in need of new brushes, new Citadel Paints, and most of all – new minis. And there was nothing for me. But I need to paint, I just need. Running low on my miniatures – it was something I haven’t expect. I was pretty sure, I have enough minis for all my Central American trip. I was wrong. I needed hobby shop. 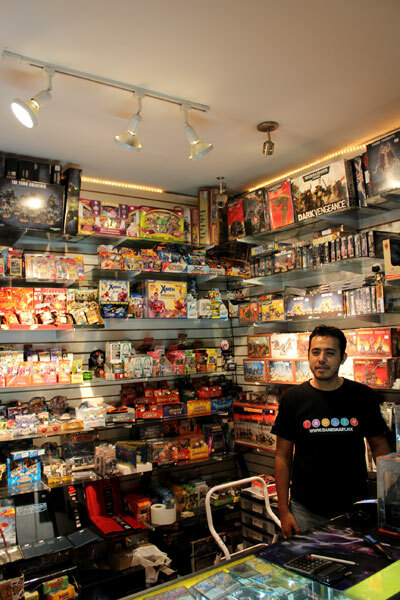 During my Google research I stumble upon one particular shop in District Federal – Gamesmart. I saw on their website, they are retail seller of Games Workshop pro ducts. Warhammer Fantasy Battle, Warhammer 40k and Lord of The Rings & Hobbit. It was exactly what I was looking for. Especially they had nice offer of Skaven minis, and they are always my first choice. Last Friday I had some more time, so I decided to go there. 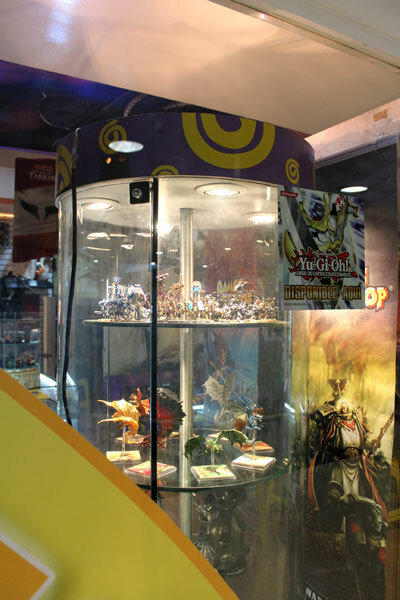 The shop is located in very nice district of Colonia Insurgentes in Shopping Centre Armand. Me and my wife got there a little bit too early (the shop was open from 11 am), so we went to Starbucks for coffee and hot chocolate. Imagine our surprise, when we found out in Colonia Insurgentes there are quite a lot of Starbucks. We managed to spot out 4! On the same street, so close to each other! Some kind of Starbucks Emporium! Crazy! We just couldn’t resist temptation:) And after nice hot refreshing beverage, I was ready for Gamesmart! In front of Gamesmart, hobby shop. Gamesmart was quite a small store on the first floor of the shopping centre. Small, but full of gaming stuff – board and card games, but what most important for me- miniatures! 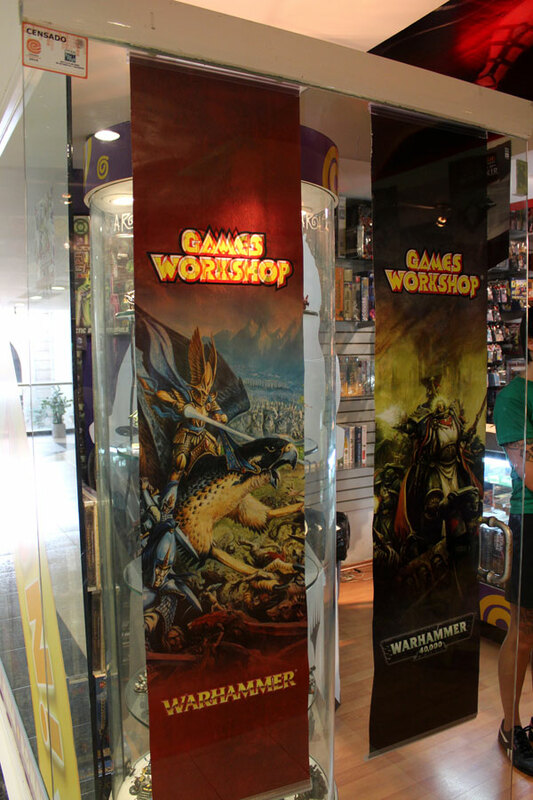 It was exactly like on shop’s online page – nice offer of Games Workshop products. There was also wide range of Citadel brushes and paints. The offer maybe wasn’t as impressive as in European stores, but I was at the time absolutely amazed. But before I started shopping, I had a little chat with Leon, the guy who was running this business. Gamesmart exists for about 3 years; right now they don’t organize any battles or tournaments in their shop. Only card games tournaments. Apparently card games are more popular than miniature gaming. It’s understandable from one hand – cards are way more cheaper than minis, but from the other hand miniatures are way more cooler (IMHO:) Leon also confirmed what I learned from visit in ‘El Duende’ – gamers in Mexico are not very fond of painting minis. They prefer to buy whole army sets already painted and prepared for battles. You pay more money, but you can start the fun right away. No way, I can understand this. I prefer philosophy: my army, my colours. Only I should decide how to paint my collection. Gamesmart also sells their products in online store. Please visit http://www.gamesmart.mx. The website is only in Spanish, and shipment valid only for Mexico, but you could generally get the idea how wide is Gamesmart’s offer. What I understand, if some products is currently unavailable – it’s no problem with order anything you just want. The shop will do anything in their power to get it for you. Miniatures I bought in Mexico City. 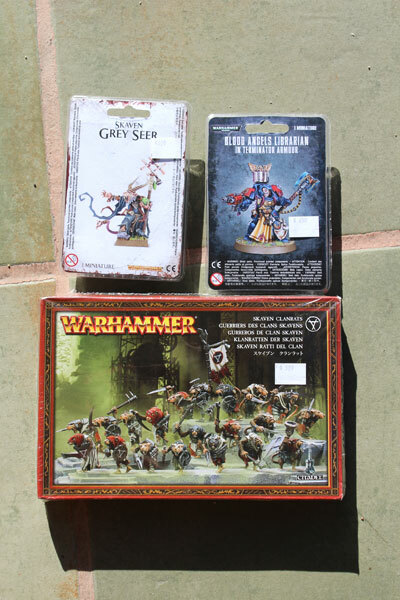 I bought Skaven Clan Rats, Space Marine Librarian and Grey Seer and two Citadel Paints – Mephiston Red and Stormvermin Fur. Clan Rats may look strange at this point, right? Don’t worry. I know what I’m doing. I need these, and exactly those models to finish my regiments of Clan Rats and Skaven Slaves. The box includes 20 rats – 10 Skavens with light armour and 10 wearing rugs and covered with scars and skin infections. My plan is to have two regiments for my 1250 point Skaven Army List as a core. 30 Clan Rats with armour, shields and spears and 30 Slaves with hand weapon only. So I need 3 boxes like that – 60 Skavens in total: 30 Clan Rats and 30 Warriors. Now, with this I bought last week, I have two. One left to complete my idea. And that’s it. I could to go to only two stores in Mexico City. I wish I had more time to stay there, to watch the battles, to chat more and generally hang out with gamers. Lack of time was the issue here. I also regret I haven’t got to two more store I found in Google. Maybe my next visit to Mexico, D.F. I’ll have more time, and I’ll pay them a visit. Right now I’ll be travelling around some different Mexican States – Baja California, Oaxaca, Chiapas and Quintana Roo. 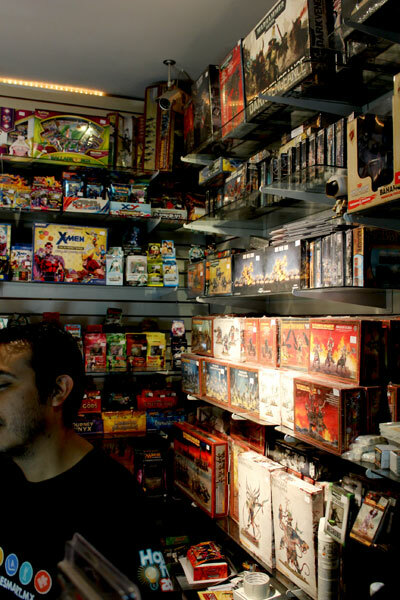 So far I found one gaming shop in Cancun and Warhammer Gaming Club in Chiapas. I hope I’ll go there and for sure you can expect a report here if I manage to do it. Until next time! Previous PostRatling Gun is ready! Next PostAre Stormvermin any good ?